Soon after I tried a regular one (I think my first scone was in Macau at the MGM pastry shop, where the chef from France is an absolute legend…. but that is a whole different story ;), I started experimenting in the kitchen to develop a healthier version of them. 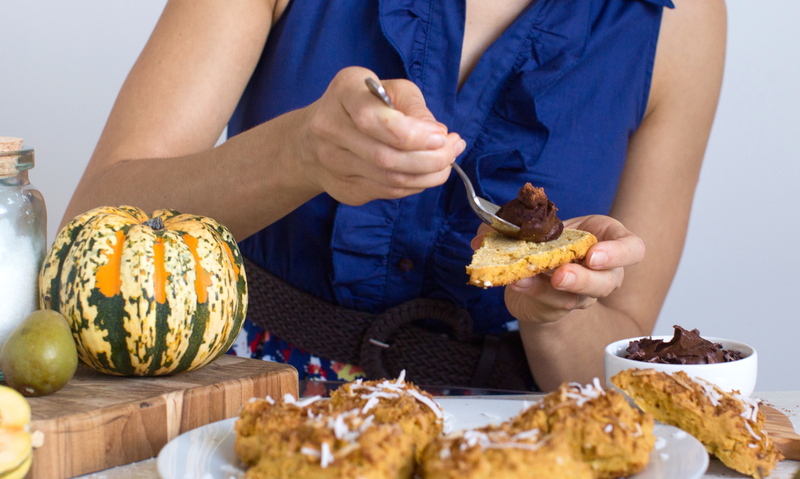 In the last few years, I have baked quite a bit of scones, but this moist and fluffy pumpkin version is by far one of the most delicious healthy recipes I have created! And you know what’s funny? I had my mamma try them as her very first scones and she was totally hooked! …Can you believe she had to wait until she was 60 to try a scone?!?! 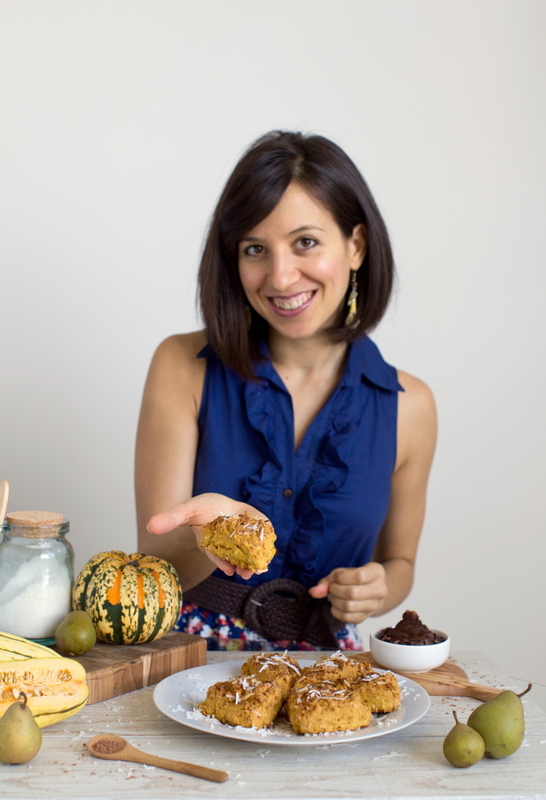 I am sure you guys will love these Gluten Free Pumpkin Scones as well, and I can’t wait for you to try this healthy gluten free recipe (that has no dairy as well) and to let me have your feedback! Sift all the dry ingredients in a bowl and mix them well. Start adding the wet ingredients and incorporate well until you get a nice batter with no lumps. Note, the batter should be sticky and thick, not liquid like regular cake batter. Scoop the batter on a baking pan lined with parchment paper. Helping yourself with a silicon spatula (or a spoon), spread the batter around giving it a circular shape and keeping it about 1 and ½ inch thick. Cut the batter circle into 6 or 8 slices (depending on whether you want your scones to be smaller or bigger) and separate them from each other so they don't stick together while baking. Bake for about 30-35 minutes. Turn off the oven, open the oven door a bit and let the scones cool down in the oven for 5 more minutes. 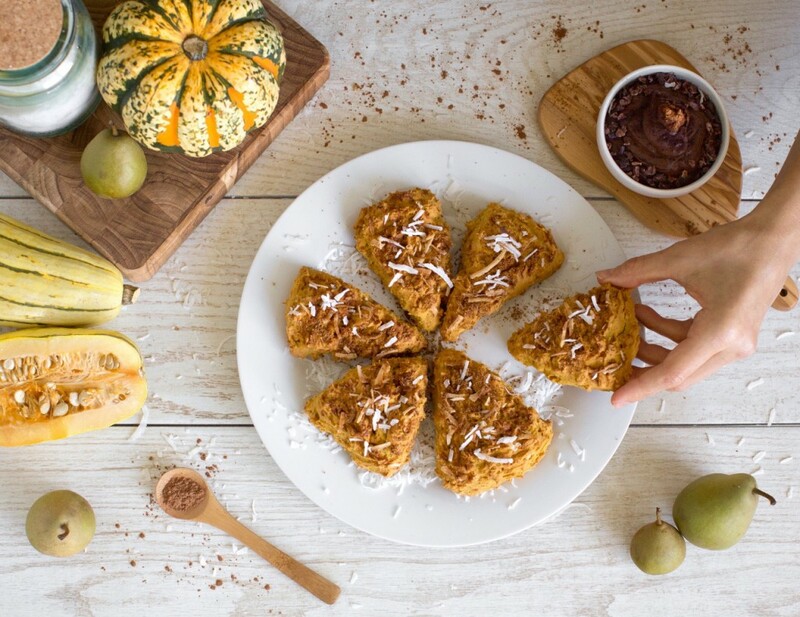 When your gluten free pumpkin scones are completely cooled down, sift some carob powder on top, sprinkle a bit of coconut flakes and they're ready to be served! And if you want to make them even more indulgent, spread a layer of Carob Nutella in the middle of your scones. The recipe is super quick and it will your pastry an even better texture!! If scones are your thing, there’s is an amazing Blueberry Coconut Scone Recipe in my EBook “How To Indulge While Eating Clean” that is packed with healthy gluten free desserts and a looooot of information about how to transform your desserts into healthy treats that are all gluten, sugar and dairy free. Hope you check it out and love it! Enjoy your healthy gluten free scones and I will catch you next time!